Management for customers, recipes and orders. Meal customization based on allergies and preferences. This service is useful to customers who are looking to save time, eat healthier, and enjoy farm-fresh ingredients. Software Solutions created a system to manage every aspect of their business from the initial sale, down to recipe and ingredient instructions for the chef. 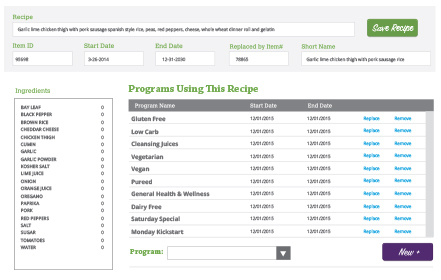 Every part of the recipe information is managed and broken down in a way that makes it easy to prepare hundreds of meals each night, without error. Tasks that could have taken all day in a spreadsheet are now done in the click of a button.